Every September for the past five years, I’ve ridden my road bike 206 miles in a single day. Since 2008 that day has ended at Jackson’s Blu Kitchen, renamed The Kitchen this Memorial Day. It’s no coincidence that my time for this endeavor has gotten faster each year. The Kitchen chef and owner Jarrett Schwartz keeps improving on his own creations. Can it get any simpler than Japanese green chilis flash fried and topped with ponzu and lemon? Or salmon carpaccio — from the clean, cold waters off Tasmania because Schwartz understands that where his food comes from influences how it tastes — topped with nothing more complicated than parmesan, olive oil, and sea salt? “I don’t even like salmon and I could eat this forever,” said my dining companion of the dish during my most recent meal there. Schwartz calls his menu “Japanese-inspired small plates.” I’d add “comforting” to his description. Yes there’s raw fish on the menu, truffled this-and-that, and Wagyu beef, but there’s no pretension. The Kitchen’s burger and truffle fries are the best in the state. Schwartz changes the burger seasonally, but it always starts with hand-patted grass-fed beef. Currently the patty is topped with triple crème brie, melted onions, and salty pickles with an option of shoyu pork belly. The fries are crispy on the outside, soft on the inside and have just the tiniest taste of truffle oil. It is this burger and these fries that I start thinking about 50 miles into my 206-mile ride. “The challenge for me isn’t how many crazy tastes I can cram into a dish, but whether I can take simple things and turn them into the best food someone has ever had,” says Schwartz. 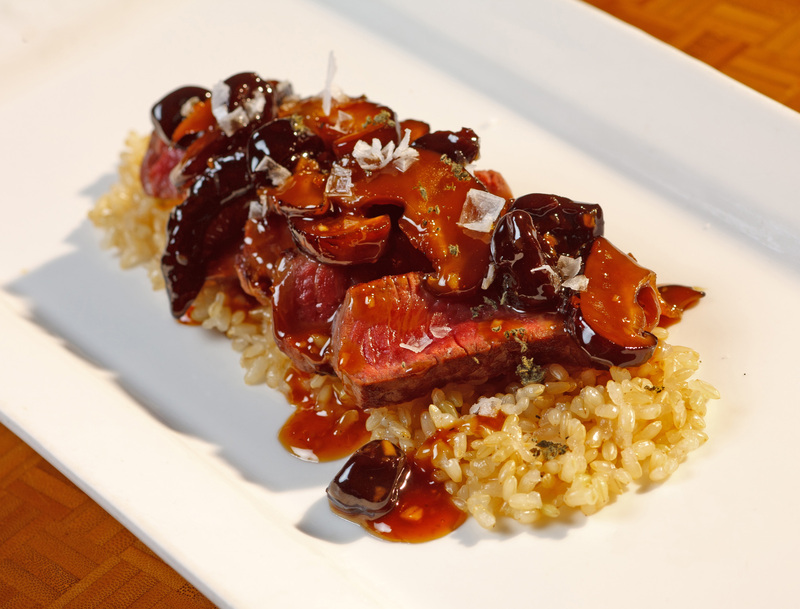 There’s nothing mind-blowing about red deer, garlic, sage, shiitake mushrooms, or sherried cherries, but together … yum. Schwartz’s Pan-Seared Red Deer has become one of the most popular menu items. 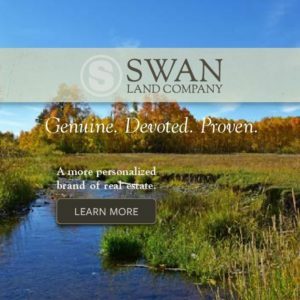 Growing up in Colorado with a mom in the catering business, Schwartz has been cooking his entire life. But it wasn’t until he was 17 and working at a BBQ joint that he got paid for it. 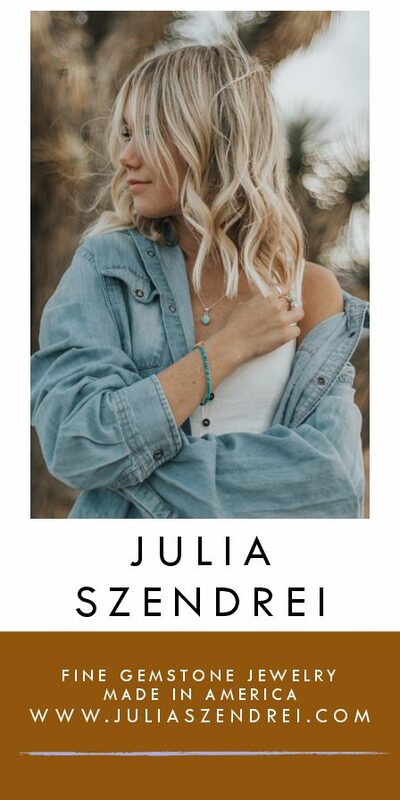 After graduating from Colorado State University with a degree in sociology and psychology, Schwartz moved to Breckenridge, Colo., and then Park City, Utah. He worked at Wasatch Brew Pub before beginning another period of education, this time in French cooking techniques at Chez Betty, named Park City’s best restaurant by Salt Lake City Magazine. 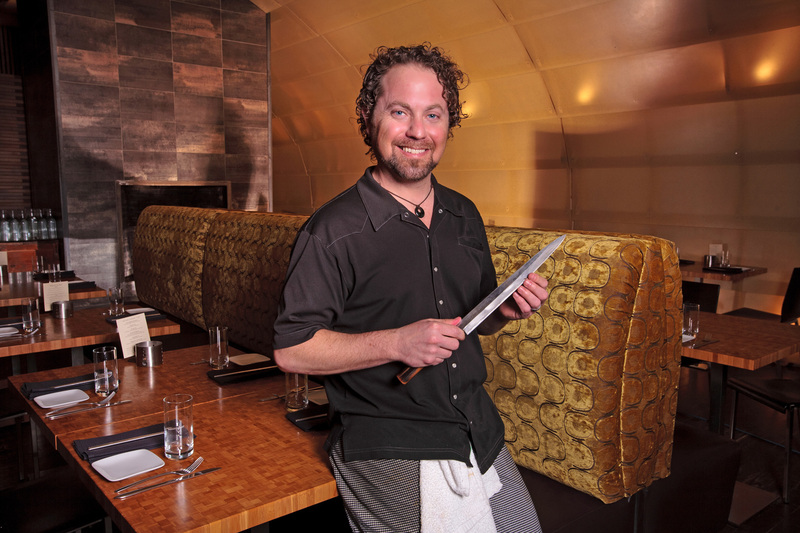 By 2000 Schwartz was the executive chef at Park City’s new Flying Sumo sushi bar and grill. Two years later he was asked to move to Jackson, Wyo., to be the founding executive chef at Nikai, which remains open to this day and still has, like Flying Sumo does, some of Schwartz’s items on its menu. “I loved working behind a bar, serving people right there, using all this great product,” he says. Eventually, Schwartz wanted to challenge himself outside the kitchen. In 2004, he opened Mizu Sushi, also in Jackson Hole. For the first time he was not only executive chef, but also part owner. “It was just a natural progression; I wanted to be in charge of my own place and do whatever I wanted to do instead of doing what someone else wanted me to do,” Schwartz says. 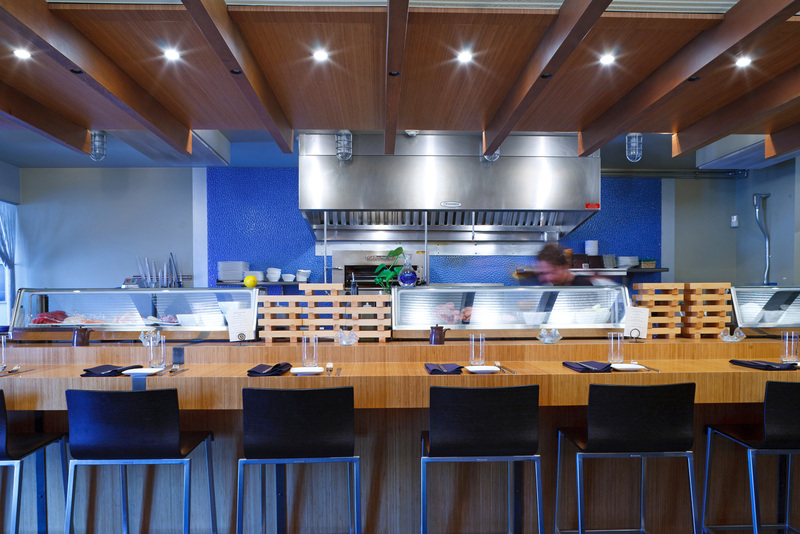 Mizu was still new when Schwartz first began conceptualizing The Kitchen in 2005. “I wanted to keep the Japanese influence, but expand the menu beyond sushi and also add some other influences as well, like Latin,” he says. Schwartz quickly found an A-frame, log cabin-y building — it wasn’t a real log cabin, but a previous owner had put log siding on it — several blocks off Jackson’s Town Square. Again an owner in addition to executive chef, Schwartz had to think of the big picture instead of just The Kitchen’s menu. And a big part of the big picture was The Kitchen’s design. The fake log cabin wasn’t going to cut it. Schwartz went to Tobler Duncker Architects, with whom he had worked on Mizu. Tobler says the biggest design challenge was how to take the idea of a cozy log cabin — “that idea of the West everyone loves and is drawn to,” he calls it — bring it into the 21st century, and also infuse it with a modern Asian sensibility. “It was a tall order,” he says. But an order that was satisfied. The building was given a new log front, stained a dark, dark brown — and had several small, square windows and one long rectangular window inserted into it. Passing it as you walk down Glenwood Street, you’d call it a contemporary cabin, especially with the glass and steel entrance Tobler Duncker added. Walking inside though, the only thing that is even remotely cabin-ish about the space is the coziness. The Kitchen only seats 49, including nine seats at a bamboo-topped bar facing the open kitchen. The interior is thoroughly contemporary. 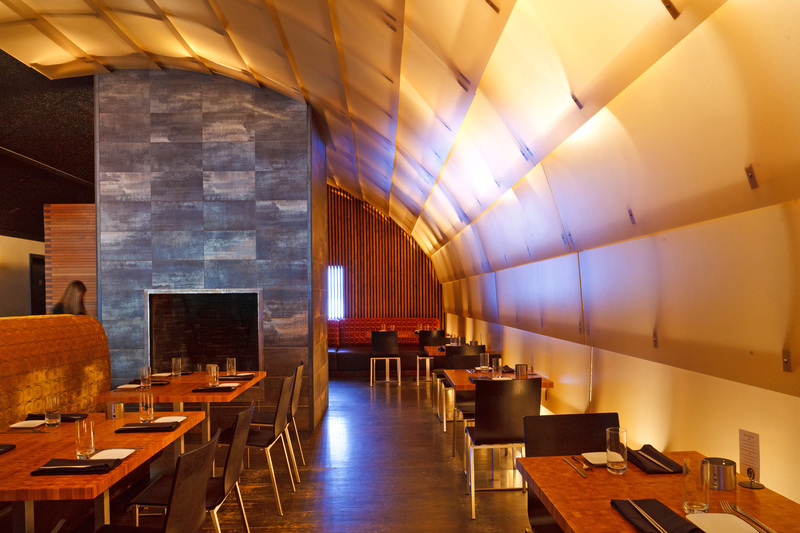 Thanks to a glowing, womb-like, curved ceiling, it’s not a cold contemporary, but a comforting one. This past May when Blu Kitchen became just The Kitchen — the name change is the result of Schwartz partnering with Jackson-based Fine Dining Group — none of this changed. What did? Schwartz doubled the number of entrees available and the sushi bar is gone. Fear not, there’s still raw fish; it’s just now a crudo bar instead of a sushi bar. There are also oysters. “I’m loving what we’re doing right now,” Schwartz says. “Any time I get to move my food in a new direction I get stoked. It’s not that I’m tired of what people have begun to consider old favorites, it’s just that I wanted to add to them.” And he has. 2 fresh carrots, boiled and pureed in blender, with pinch of salt, then chilled. Cheese – combine cheese, lemon zest and chiles, add a pinch of salt, mix well. Beets – cook 400 degrees, on a bed of sea salt for one hour or until softened, cool and peel, then dice. On chilled plate, spoon out ricotta cheese mix, toss, mix beets, arugula and almonds with dressing in bowl. 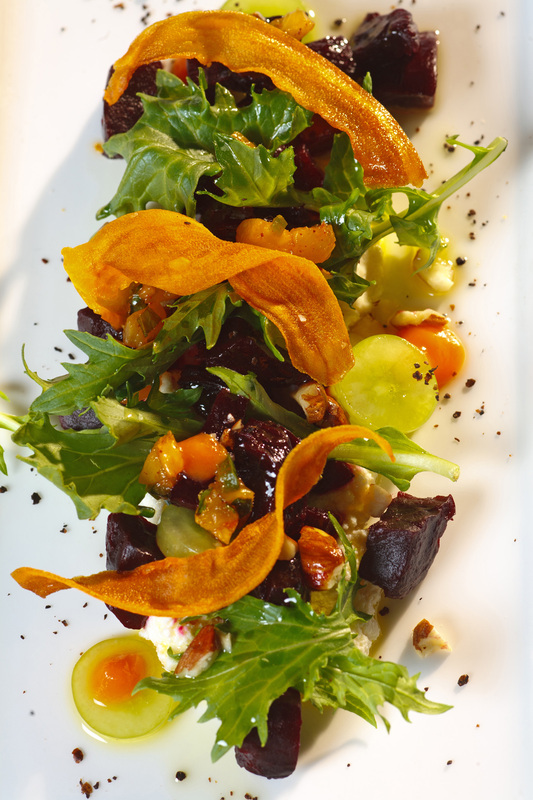 Arrange on plate, dot with carrot puree to garnish, arrange crisp sweet potato shreds artfully on top. A recent (but minor) remodel (to go along with the restaurant’s new name) replaced the sushi bar at The Kitchen with Jackson’s first crudo bar.